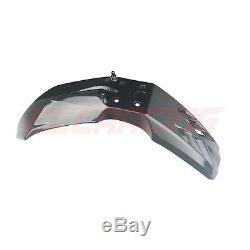 KTM 690 SMC/R 690 ENDURO/R CARBON FIBER Front Fender TWILL Glossy. KTM 690 SMC 2008 - 2011. KTM 690 SMC R 2012 - 2015. KTM 690 Enduro 2008 - 2010. KTM 690 Enduro R 2009 - 2015. High quality TWILL weave carbon fiber surface, fiberglass backing; Epoxy resin for high strength; UV protective clear coat with glossy finishing, no fading; Most of our parts are predrilled, replace the original (but will not come with hardware/mounting kit/mounting brackets/screws, please use original hardware/mounting kit/mounting brackets/screws). The item "KTM 690 SMC/R 690 ENDURO/R CARBON FIBER Front Fender TWILL Glossy" is in sale since Wednesday, April 4, 2018.